The 1958 Ford Trucks had very few changes over the previous 1957 Ford Trucks. 1958 marked the 10th anniversary of Ford F-Series trucks. Most noticeable among the changes were the new "eggcrate" grille and quad headlights. All of Ford's cars & trucks had the 4- headlight setup for 1958, the grille on lower models was painted Colonial White, the upgraded grille was bright (chrome). There was also a new line of heavier-duty model trucks called Super Duty, which came equipped with new V8 engines up to 534 cid. The interior knobs were changed from black to white. New color choices for '58 included new shades of grey, green, and blue, in addition to the return of Goldenrod Yellow. There was a mid-year change for the V8 engine. The 272 cid engine that made 181 horsepower was replaced by a 292 cid V8 engine that produced 186 horsepower. 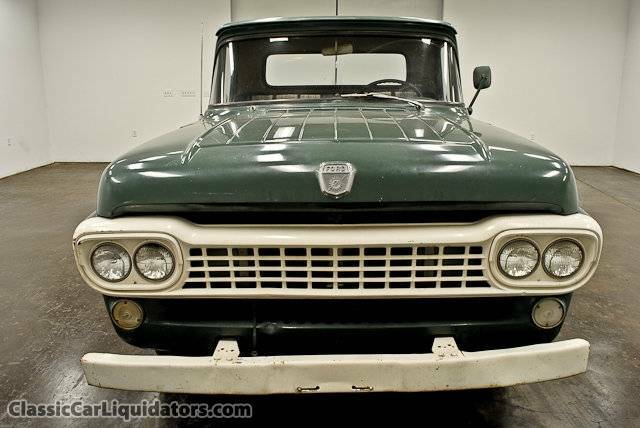 The photos shown above of the green 1958 F-100 are used with permission from ClassicCarLiquidators.com.